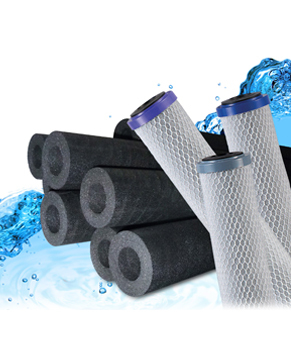 Our high Performance Activated Carbon Block (CTO) covers a wide array of applications in drinking water treatment, including point of entry, point of use filters. Chlorine or Chloramines are used extensively as disinfecting agents in process or influent water purification and it needs to be removed. Since it affect water quality in term of taste and odor. In high concentration the chlorine or chloramines may be hazardous to health. Our premium dechlorination carbon block is tailored specifically to meet the dechlorination effects and removal of organic contaminants in the water, dust and other impurities.